Prior to the rise of the bourgeoisie, historical revivals in dress were the preserve of the aristocratic classes, principally employed as costume either for masquerade and pageantry, portraiture or professional function (courtly and legal uniform), and always as a distinguishing mark of timelessness and status-of both power and beauty. From the sixteenth to eighteenth centuries, fashions in the choice of historical focus were mainly informed by divisions between town (the urban powerful) and country (the Arcadian idyllic), and received ideas of morality and immorality. The meaning and embodiment of the latter coupling shifted most frequently-morality at some stages implied by Anglo-Saxon mythologies of status and structure. 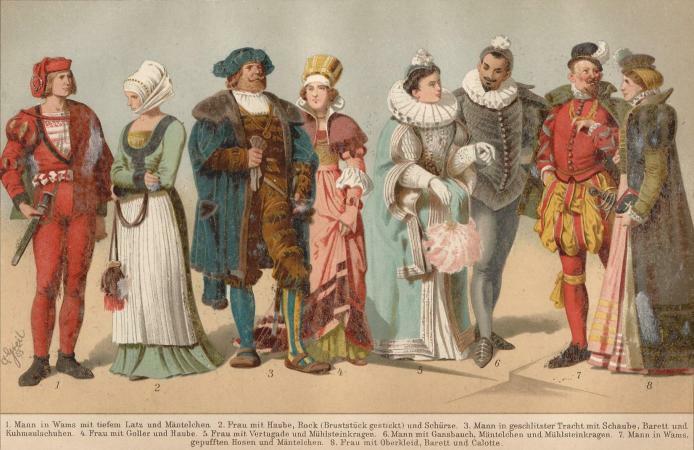 The body coverings most frequently represented by fashions were crinolines, hoops, bustles, and corsetry for women, and armor and padded upper bodies for men. In turn, however, the looser costume of Greco-Roman mythology and the reverence for the ideal physique, and the beauty of nature that they represented, were also held up as archetypes of morality in different periods-although they were usually quite swiftly decried for their immorality in openly revealing the female body. As with all the revivals to follow, these trends were rarely based on historical accuracy, relying primarily on a nostalgic imagination and secondhand source material. The original fifteenth-century Gothic dress for women combined thirteenth-century ideals of fitness for purpose and an ecclesiastical sensibility (headdresses in particular bore direct reference to the wimple) with beauty of line and sumptuous fabrics (velvets and brocades). Gothic revivalism was already taking place in the mid-seventeenth century (the Puritans drew on the religious overtones of the Gothic in the face of Royalist decadence), and was popularized again in the mid-eighteenth century as a decorative and architectural movement (Gothick), its leading proponents including Batty Langley (1696-1751) and Horace Walpole, whose Strawberry Hill project (1750-1770) came to epitomize the period. The eighteenth-century revival was a movement driven by romance, and one that stood against the perceived rigidity and rules of the classical style; the medieval appeared more natural, fantastical, and foreign compared to the worlds of Greece or Rome. In dress, its expression was principally neomedieval, somber in tone and concentrated on flat, embroidered pattern on sleeve and bodice panels. It was notoriously inaccurate and widely ridiculed until the 1830s when A.W. N. Pugin (1812-1852) proposed an accurate and faithful return to Gothic style as a nationalist, moral, and spiritual bulwark in the face of advancing industrialization. Pugin's work heavily influenced the Victorian aesthetic and later, the flat printed pattern of William Morris (1834-1896) and the Arts and Crafts movement. In the late twentieth century, the Gothic style returned again as an addendum to punk, drawing on but darkening the punk movement's oppositional stance and twisting the spiritual meaning of Gothic style to embody older, more mystical religions (such as Wicca, paganism, and Buddhism). But, as with previous Gothic revivals, 1980s' goths embraced the romanticism of the movement, combining the PVC and rubber of punk with the velvets and brocades of their eighteenth- and nineteenth-century predecessors. The taste for what became known as neoclassical style has its roots in the 1750s, emerging in opposition to the exoticism and opulence of the rococo (promoted by the launch of the Dilettanti Society in 1734 and the Society of Arts in 1754). Much of the literature (Rousseau) and painting (Gainsborough, Reynolds, and Hogarth) in the decades leading up to the neoclassical movement was directed toward proposing a romanticized classicism as a moral tendency linking the purity of nature with purity of spirit. It was possible for both the neoclassical and the Gothic to exist in much the same space, due both to the opening up of society to fashion and to the shared beliefs of each movement. 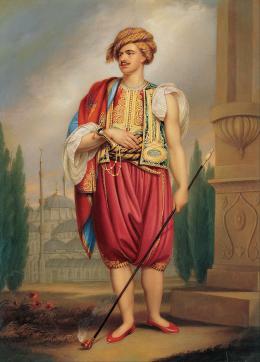 The movement achieved prominence in the 1780s and is most closely associated with Thomas Hope (1769-1831), whose Costumes of the Ancients (1809) and Designs of Modern Costumes (1812) were pivotal to popularizing the looser, unstructured Greco-Roman dress styles. Dresses were made principally from muslin with waistlines rising to the bust, which was still firmly secured by stays and highlighted by a sash and knotted scarf. The effect was naïve and childlike, best expressed in the popular 1880s' illustrations of Kate Greenaway. In keeping with antique statuary and notions of the ideal physique for men, tightly fitting breeches and cutaway jackets revealed more of the body. Hope was also an exoticist and hosted Turkish-inspired parties at his home, similar to those favored by the Parisian designer Paul Poiret (1879-1944) in the early twentieth century. Poiret and two other designers of the period, Madeleine Vionnet (1876-1975) and Mariano Fortuny (1871-1949), were the principle players in the revival of the neoclassical in the 1920s and 1930s (also known as vogue regency). As with neoclassicism, the aesthetic movement studied and celebrated beauty. The movement took hold in the United Kingdom in the 1870s. Its proponents in the decorative arts (William Morris), literature (Walter Pater, Charles Baudelaire, Oscar Wilde), and fine arts (James McNeill Whistler, Aubrey Beardsley, and the Pre-Raphaelite painters) proposed elegance in everything. Nature (flora, fauna, and the athletic human body) was eulogized in all its glory as the epitome of beauty, a manifestation of God on Earth. What separated Gothic and aesthetic was the latter's belief of "art for art's sake" as shifts in understanding over the nature of morality gave rise to an intense dispute between the Philistines (art as a medium for social and moral purpose) and aesthetics (art as beauty and truth) that raged throughout the 1860s and 1870s. The proponents of grace, athleticism, and activity for women had to wait for the Rational Dress Society, launched in 1881, to put forward their case. The Healthy and Artistic Dress Union swiftly followed it in 1889 pronouncing Victorian restraint unhygienic and spiritually detrimental. Women's clothing became looser, more opulent in texture and heavily influenced by medieval styling, folklore, fairytale, and Arthurian legend. The figure of woman as represented in painting was most commonly sleeping-a state of innocence and purity that also implied the awakening, or liberation (sartorial and sexual), into womanhood that was to follow in the fin de siècle era of decadence. The legacy of the aesthetic movement is most clearly seen in the artistic circles of the Bloomsbury Set in the early twentieth century and the hippie movement of the 1960s. The Teddy boy (derived from the nickname of Edward VII) grew out of a sensibility fostered in post-World War II Britain that the shared hardships of war and rationing would result in a more egalitarian society (Polhemus, p. 34). The expectations of the young working class were manifested in the reworking of a neo-Edwardian style that had been pioneered by London's Savile Row tailors for their upper-class clients-single-breasted, long, and fitted jackets with velvet collars were worn with drainpipe trousers and brocaded waistcoats. Young men from the East End paired similar clothing with a cowboy's tie and the extravagant sentiments of American East Coast, black Zoot style. The adoption of these specific signifiers served to ally Britain's working classes simultaneously with the American Dream, and the outsiders who challenged it. 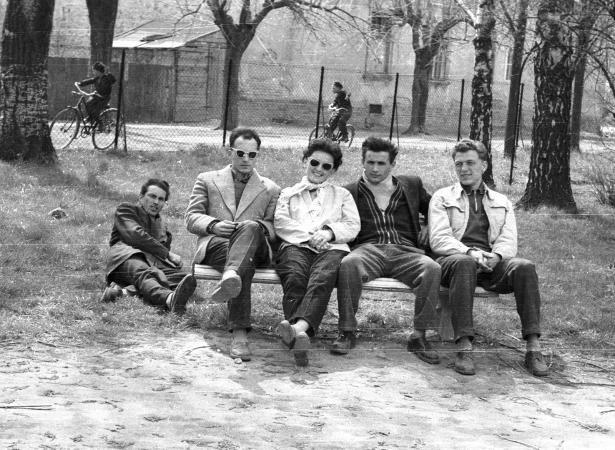 In doing so, the Teds presented a challenge to establishment British society, particularly by subverting aristocratic dress codes, and this subcultural style served as blueprint for all the street style that followed in the latter half of the twentieth century. The fashion for retro styling had often left the industry open to accusations of moribund nostalgia. Both at street level-the Teds by the Edwardians, the mods by the Italians, glam-rock by the aesthetics, the casuals by the mods, the goths by the punks-and at the level of high design, the speed and influence of revivalism has increased incrementally over the last forty years, to the point that even futurism is retro. But critics ignore the importance of sociopolitical and cultural context in the process of selection. This is particularly apparent in high design. Walter Benjamin, in Theses on the Philosophy of History, speaks of the creative "tiger's leap" into the past, the aggressive and specific selection of historical reference to serve contemporary comment. Historical revivalism is most often used as a tool to create a pervasive, and recognizable, environment for fashion that responds very pertinently to the times in which it is created. Arguably, there is nothing new to create, only creative ways of reinterpreting the past. As the designer John Galliano points out, "What's modern? … Gucci? Or Prada? That's just their interpretation of modern but it's still a historical take…. I think reinterpreting things with today's influences, today's fabric technology is what it's all about" (Frankel, p. 176). See also Aesthetic Dress; Goths; Retro Styles. Burman Baines, Barbara. Fashion Revivalism: From the Elizabethan Age to the Present Day. London: B. T. Batsford, Ltd., 1981. Lambourne, Lionel. The Aesthetic Movement. London: Phaidon Press Ltd., 1996. Polhemus, Ted. Fashion and Anti-Fashion: An Anthropology of Clothing and Adornment. London: Thames and Hudson, Inc., 1978. Walter Benjamin. "Theses on the Concept of History." Previously available from http://www.tasc.ac.uk/depart/media/staff/ls/WBenjamim/CONCEPT2.html .